Once you see the first neighborhood door bearing an Indian corn bouquet, two things tend to come to mind: Halloween and pumpkins. While Halloween is practically a national holiday in America, Europe has joined us in full force. In fact, Halloween is the world’s second-largest commercial holiday after Christmas and each year, from the beginning of October, there are plenty of events and colorful parades taking place throughout Europe. Since Columbus brought the seeds back to the Old World, Europe has embraced the virtues of pumpkin-based cuisine. This quick-and-easy recipe leaves time to add a final flourish of candied walnuts, thyme and thin parmesan shavings over each colorful bowlful. Place olive oil in a large saucepan. Add shallots and onions and sauté for 4-5 minutes. Stir in pumpkin puree, salt, pepper, cumin and broth. Bring to a boil, reduce heat and simmer for 10 minutes. Remove from heat and stir in parmesan cheese. 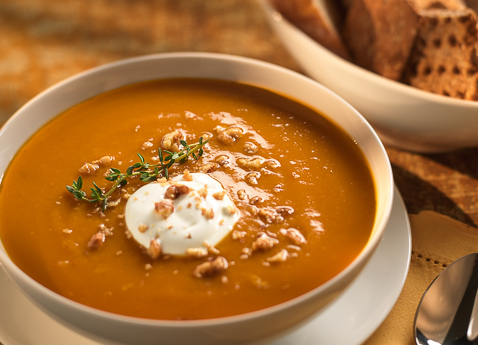 To serve, ladle into bowls and garnish with sour cream, walnuts, thyme and parmesan shavings.